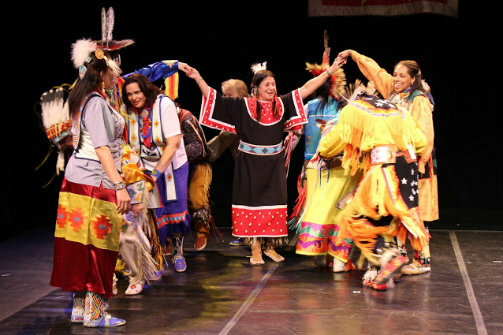 The ensemble of The Thunderbird American Indian Dancers In Concert. Photo by Remi S.
BOTTOM LINE: The passionate Thunderbird American Indian Dancers invite audience immersion into Native American culture. The Thunderbird American Indian Dancers In Concert is more than just a show—it's an expression of heritage. The hour and a half-long performance of traditional songs and dances features snippets of traditions from a variety of tribes across America. The opening music, featuring the Heyna Second Son Singers and ensemble with traditional costume and instruments, wonderfully sets the tone for the piece. Immediately following the music, Louis Mofsie, the narrator for the evening, introduces the cast, citing the tribes they belong to, and very conversationally explains the tone of the evening and the value and meaning behind the traditional pieces to come. The twelve performance pieces, mainly song and dance, rely heavily on tradition and celebration of notable accomplishments or social pride, such as success in battle (Smoke Dance), or a coming-together of young people (Stomp Dance). Each piece holds great meaning to the performers, made clear by both the thoughtful narration behind each performance and the utter joy expressed by performers whenever they grace the stage. Matoaka Little Eagle is a particular standout. She tells the story of the “Boogeywoman,” who lives in the mountains and eats children who do not listen or take their baths. Little Eagle has a contagious energy onstage. Not only does she tell the story with wonderful vocal energy, consistently utilizing character voices whether they be a young child or a mythical creature, but she completely physicalizes every one. Within her story, she sings multiple comical songs (self-accompanied by a drum) and introduces an element of audience participation giving the audience a phrase to repeat to ensure that they are “still listening”—which they were, every second. Another standout moment is the “Round Dance” where the cast invites the audience to come up onstage and encourages them to learn and participate in a dance celebrating friendship. The audience and cast alike join hands and do a simple step in a circular motion, allowing the audience to truly immerse themselves in the culture they have been observing throughout the evening and connecting them to traditions that may have previously been foreign. The ensemble works beautifully together and are as passionate about their culture as they are about their art. Their joy and emotional freedom onstage is contagious, and their words and actions are educational, enjoyable and eye-opening. The Thunderbird American Indian Dancers In Concert is narrated by artistic director Louis Mofsie. Lighting Design is by Alex Bartenieff. Guitarist is Rob Mastrianni. Stage Manager is Dawn Hartop. The cast is Alan Brown, Sandi Capasso, Isabelle Cespedes, Matoaka Little Eagle, Julian Gabourel, Kitty Gabourel, Dale Legones, Louis Mofsie, Carlos Ponce Eagle Feathers, Marie Ponce, Michael Taylor, and Ciaran Tufford.